MILWAUKEE (AP) — Chris Iannetta made contact, all right. He slammed his bat over his right knee, splitting it in half after a strikeout with the potential tying run at third base in the seventh inning. Connecting with the ball? Not so much. 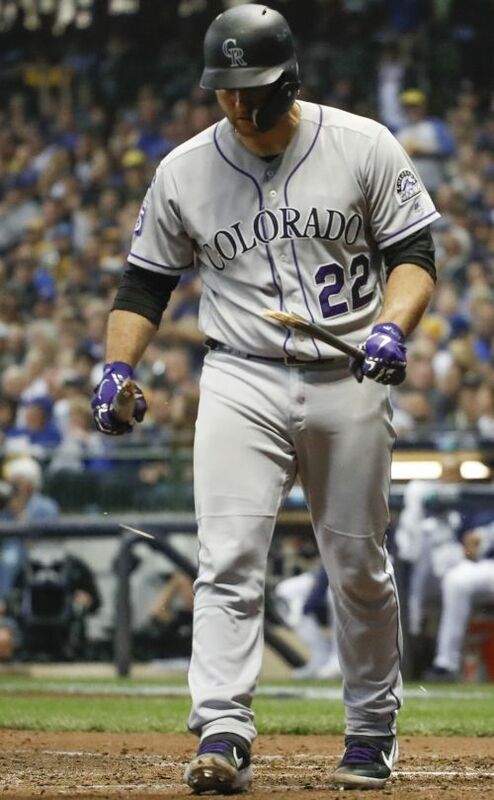 It was the same old story for the Colorado Rockies in Game 2 of the NL Division Series: Their power-laden lineup couldn't score runs. No wonder they're down 2-0 in the series following a 4-0 loss on Friday at Miller Park. Game 3 is Sunday in Denver, with the Rockies sending German Marquez to the mound against Milwaukee's Wade Miley. Facing elimination, maybe the thin mountain air will do Colorado some good. "You just keep fighting through it and having good at-bats," manager Bud Black said. "So we've got to keep fighting the good fight." The Rockies finished among the major league leaders in several offensive categories this year. But they've scored just six runs in four games since slugging five homers in a 12-0 victory over Washington on Sunday that left them tied for the NL West lead after 162 games. They dropped a tiebreaker with the Dodgers for the division title and then squeaked out a 2-1 victory over the Chicago Cubs in the wild card game before taking their quiet bats to Milwaukee. Colorado's three All-Stars — center fielder Charlie Blackmon, third baseman Nolan Arenado and shortstop Trevor Story — are scuffling. The trio is a combined 3 for 23 in the series with two RBIs — both in the ninth inning of Game 1, which the Rockies lost 3-2 in 10 innings. Take away that rally and it's a series shutout for Milwaukee. Colorado stranded nine runners in Game 2. "It's been a tough past couple days for us offensively, there's no denying that," Story said. "We're going home and we feel confident that we can turn it around." Blackmon, who hit .291 with 29 homers in the regular season, hit a sharp liner right to second baseman Travis Shaw to end the seventh, stranding Ian Desmond at third. The bearded Blackmon slammed his batting gloves into his helmet after being retired by filthy left-handed reliever Josh Hader. Blackmon finished 0 for 4. Arenado, who hit .297 with an NL-high 38 homers, struck out twice on sliders from Brewers starter Jhoulys Chacin, seeing just three pitches in each of those at-bats. Arenado also had the only two hits among the All-Star trio on Friday, including a one-out single in the eighth off Jeremy Jeffress. The next hitter, veteran Carlos Gonzalez, lined out sharply to third to set up a familiar Story. The shortstop struck out swinging on a curveball in the dirt, his fifth whiff of the series. Story's struggles might be the most puzzling. He had seven homers and 18 RBIs against Milwaukee in the regular season. "The last few games have been a little bit tough. And they've been rough for a lot of guys now," Black said. And that was before Game 2 started. The frustration was epitomized by Iannetta's bat-breaking at-bat . "I got a slider over the middle of the plate that I thought I was on," Iannetta explained, "but I was obviously out in front of." Another lament for the Rockies' punchless sluggers: Their pitchers are keeping it close. Game 2 starter Tyler Anderson allowed just one run on four hits, walking two and striking out five over six innings in his first postseason start. Reliever Scott Oberg allowed hits to Hernan Perez and Travis Shaw to put runners on first and third to open the seventh. But Oberg fanned the next three hitters to get out of the inning. The Colorado offense showed a little life again in the ninth when Gerardo Parra had a leadoff single off Jeffress. Their season may be over soon if they don't start hitting in Game 3. "I feel like we're going to score every inning," Anderson said. "Just because we haven't, it doesn't leave any doubt in my mind that we're going to score in the first on Sunday."